How many of you readers can recognize the sound of a safety relief valve popping? Aramco annuitant Dr. Mohammed Ifteqaruddin, Badge Number 140948, can. For thirty-three years, Mohammed dedicated himself to issues relating to safety relief valves at facilities throughout the Kingdom, beginning in 1977 when he joined the Ras Tanura Refinery Maintenance Department’s Machine Shop as a maintenance machinist. 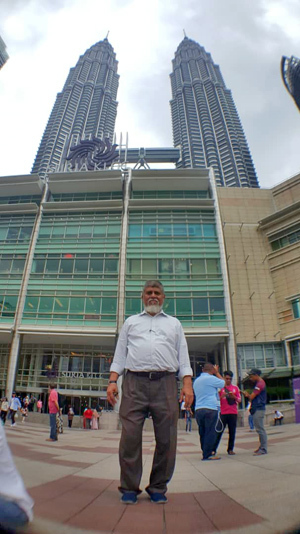 By the time of his retirement in 2010, Mohammed had risen to the position of Technical Advisor of Mechanical Services. While in Arabia, Mohammed lived in the Radwa and Najmah compounds as well as in the local communities of Rahima and al-Khobar. Since retiring, he founded the Saudi Aramco Ex-Employees Association, based in his home city of Hyderabad, India. Today he serves as General Secretary of SAEEA. “Mohammed was delighted when he received an offer to join the world’s largest oil company in 1977. He started with the Ras Tanura Refinery Maintenance Department’s Machine Shop Unit in the Safety Relief Valve Segment as a maintenance machinist. “He later served as unit head and now retires as technical advisor of Mechanical Services, after three decades, still part of Ras Tanura Refinery. “He said he has enjoyed his work. ‘There were ups and downs, but there were also new developments,’ he said. ‘It was an honor for me to train young Saudi technicians and engineers in this field.’"
“Mohammed traveled all over the Kingdom as Saudi Aramco’s first safety relief valve test conductor, certifying relief-valve technicians. He said he learned a lot through the management courses offered by the Leadership Center. “He said the most challenging job for him was in-place testing of boiler safety valves during midday on top of the boilers amid tremendous noise with super-heated valves popping. He has participated in several technical exchange meetings and forums." In a recent article, AXP recognized the importance of the contributions Aramco annuitants have made over the years to the company, the Kingdom, and the people of Arabia teaching Saudis the nuances of their particular areas of specialization. Dr. Mohammed Ifteqaruddin’s career with Aramco, and the valuable work he has done in retirement, is an outstanding example of this. Readers can reach Mohammed via email at: [email protected].